I support Mayor Berman's proposed policy that the Town of Gilbert Police should turn over all illegal immigrants to the federal government. I was really impressed by the deportation of the Mexican juveniles that were endangering our streets. Please ask me at anytime to prove my citizenship, I am proud to be an American. The state and federal government have failed to protect the borders of this Great County and State. Thank you for stepping up to protect our town!! I cannot begin to tell you how nice it was to open up the newspaper this morning and see the headlines. Your statements regarding illegal immigration were so refreshing. I felt the same about our fine police department calling ICE last week. We live in Gilbert because the quality of life is high, if we allow illegals to move in/stay that quality of life is in jeopardy. All you have to do is look to our neighboring town of Mesa to know what can happen if you allow it. Keep up the good work and again thank you!! Thank you for your courage to deport the three illegal aliens. Subject: Nice work, mayor and council. THANK YOU for taking such a brave and unprecedented stand in helping to preserve the quality of life and public safety of Gilbert. Outstanding news. Our city will not turn into the "sanctuary cities" of Chandler and Mesa, ruled by and in constant fear of a small but vocal group of ethnic greivance-mongers whose sole aim is to advocate for, accommodate, and facilitate illegal aliens. Cities like Chandler, Queen Creek and Mesa meekly accept the easily forged Mexican matricula consular, favorite ID of identity cheats and Central Americans who hope to avoid deportation further than the Mexican border if ever caught, thanks to the demands of hustlers from the Interfaith and ethnic cabals. Their downtowns are seedy, blighted and overflowing with all manner of urban ills. Day laborers who lack ID, lack legal status and have criminal records who choose to work underground clog the streets, loiter, and harrass local residents; their unwanted and objectionable practices are explained as cultural differences or ignorance in an unfamiliar enviornment. Driving without ID, insurance, registration, unsafe vehicles and driving practices by those who ignore or are ignorant of laws, and have nothing to lose by fleeing or giving a false identity, places residents and public safety at risk. Mesa and Chandler are popular places for numerous load or stash houses, motel rooms and smuggling networks. I have seen none of the above in any form in Gilbert. I come home to quiet, cleanliness and the quality I would expect my tax dollars to pay for, and none of the stressors or scenes of the above. I hope that Gilbert forms a closer partnership with ICE since ICE is now willing to respond to every law enforcement assistance call, and investigate further or refer any articulable fact that would lead to the disclosure of illegal immigration status for anyone, be they Mexican or Canadian, English or Chinese. Please keep it up and don't back down; clearly the residents of Gilbert, not the agitators who reside outside the city borders, fully support the city's stand. Proud resident of Gilbert, and more so now. As a resident of Gilbert I applaud your efforts on dealing with this problem. There is a reason I live in Gilbert. I also would like to commend you and your office on curbing check cashing stores, halfway houses, pawn shops, and low income housing areas. Per Tribune article "Gilbert officials propose policy on illegals" you are doing an excellent job for your City and State. Your approach on Illegal Immigration is right on target and the success for your City is going to be a role model to many other Cities across the United States. Keep up the good work and know that the vast majority of Arizona citizens are behind you. Don't let the pro-illegal immigrant groups distract you from this very important task. I am a Chandler resident and have contacted my Mayor and council members many times in the past asking them to take a stance like yours on Illegal Immigration. Finally somebody in the East Valley is starting to take this issue seriously. I hope the other council members are behind both of you. A big thank you for having the courage to stand behind officers upholding our illegal immigration laws. If more cities in Arizona and across the country supported the "no sanctuary" policies as the town of Gilbert has, our country could get a better handle on these issues. Thank you again and keep up the good work, the majority of citizens are behind you! We salute you with an overwhelming "Thanks" for your city's recent action deporting illegal teens who were breaking several U.S. laws (being here illegally and driving without a license). Who knows how long this activity has gone on that we citizens are not allowed to do - and no one should ever do, for the protection of every driver and pedestrian in our communities. We live in Sun City West, from Minnesota recently, but you get our vote! Keep on keepin' on to oversee your locality with strong safe-guarding directives, protecting your legal hard-working families who strive to be good law-abiding neighbors. PLEASE continue faithfully to see that your streets and schools remain a safe place where your Gilbertites can live as Americans expect, knowing they are served by caring, confident civil servants who uphold protective laws thankfully in place for good reason, such as these are. God bless you, Steve, and your city. Such actions protect all of us in the Valley of the Sun. Thank you for standing firm on the deportation of the 3 youths caught drag-racing. It is time that we as a State and a Nation enforce our laws and not play into the political pandering and sympathy of those who think breaking our laws should be tolerated because those here illegal are just trying to make a better life. Continue to abide by and enforce the laws that Government officials took an oath in doing so. Stick to the facts, The Constitution and The AZ State Constitution and then how can anyone argue that one is not doing their job. By doing so, your city will be a great representative of this State. I just wanted to say thank you for calling ICE when you had the three teens in custody and for turning them over. You have done a great job protecting our city. Dear Mayor, Thanks for getting out of line and blazeing another trail' one we all must follow to protect our country! If you need any assistance from a signature to a soldier please advise. It's a busy day here so if you would, please pass these sentiments down the line . Congratulations! About time we started doing that! Subject: Thank you for taking the lead standing up against illegal immigrants! Thank you for taking the lead standing up against illegal immigrants. I admire your actions and wish other mayors adopt your actions (Let me know when you run for Governor). I salute you! I truly wish I lived in Gilbert so I could vote for you. Wish Phoenix had your backbone. Hope to vote for you for the Governor job one of these days. I would like to offer my sincere appreciation for the job the City of Gilbert did with the handling of the recent drag racing incident. I applaud not only yourself, but the City of Gilbert Police Depeartment for following the law, contacting ICE, and deporting the 3 teenage felons that were drag racing over the weekend. Anything I can do to thank you for taking a stance against allowing Mexico (or anyone south of the border) from taking over the Southern US, would never be enough. We have an uphill battle on our hands. Hit hard and hit as often as you can. They are breaking are laws and injuring our citizens enough enough enough!!! I am a Gilbert resident, but work as a Chandler Police officer. I love your new idea of training officers in immigration laws. If, ...when you start this up I want to attend! I would even go on my off time, if my employer does not authorize it! I often find myself arresting illegals for many crimes, often felony crimes as well, ICE refuses to respond and the court will not hold them depsite my informing them they are illegal. Please let me know how to sign up for this once its in effect. I would like to personally thank you for allowing your Police Officers to do their job. In particular, the incident when one of your Patrol Officers made a traffic stop last Sunday and pulled over a vehicle that was in essence drag racing on the city streets. Three illegal alien youths were inside the vehicle and the driver had no license nor proof of insurance. The courageous decision made by the Patrol Officer, Patrol Sergeant, Watch Commander, and probably Patrol Division Deputy Chief to allow ICE to be called and respond to deal with these illegal aliens reflects strongly on the Police Departments commitment to Public Safety. The media, in particular the Arizona Republic, is sensationalizing the plight of the poor families of the deported youths. Never once have they mentioned that your Patrolman removed a dangerous driver off the roads who jeopardized the safety and possible loss of life from citizens of your community through his reckless actions and blatant disregard of traffic laws. Please pass on my thanks to the Police Department Patrol Division for their handling of this incident in a thorough, competent, and professional manner. Their actions reflect strongly on you and your City Council. Thank you for helping to maintain Arizona and American sovereignty by enforcing immigration law! Thank you for your support of our laws and Constitution. Would you consider running for governor or possibly for president? We need more politicians that believe in supporting the citizens of this country, rather those that enter illegally and demanding 'their' rights. The course of action you and the City Council are taking is a winner. Don't let the other side get you down. You're doing a great job! They weren't students your city help deport, they were ILLEGAL ALIENS. Fantastic job. Now Gilbert makes me proud to be from Arizona. Just wish all the other cities would step up to the plate. Keep up the good work!! THANK YOU FOR DEPORTING THE ILLEGAL ALIENS YOU CAUGHT DRAG RACING AND FOR STANDING UP FOR AMERICA AND WHAT IS RIGHT!!!!! IT TAKES COURAGE TO DO WHAT YOU DO AND WE APPLAUD YOU AND THANK YOU FROM THE BOTTOM OF OUR HEARTS! I was delighted to read about your stance on illegal aliens in the Tribune today.You just have to wonder how many people are driving around with no license,and no auto insurance.BRAVO to you. Dear Sir: MANY THANKS AND THANKS TO OUR FANTASTIC GILBERT POLICE DEPT. FOR DEPORTING THE ILLEGAL SPEEDERS FROM OUR COUNTRY!! There are many of us out here in Gilbert and adjoining communites that treasure you and our police force for their prompt and welcome actions and certainly make me feel much safer living in Gilbert and not being intimidated by these illegals who wish to be here illegally. Very sincerely: Barbara L. Stewart, Gilbert AZ. nice if all cities across America followed your lead. This e-mail is from just one appreciative citizen in Arizona for you deporting illegal aliens but let me assure you, there are many thousands more who appreciate your dedication to our state. We Arizonan's wish we had more knowledgeable and educated individuals like each of you. OUR SINCERE THANKS AND APPRECIATION. Hon. Mayor Berman, thank you for protecting the citizens of Gilbert. I have relatives in your town (Washington St.) and we are grateful for your handling of the 3 youngsters. Your City, the Police Dept, and the officers who did their job have every right to protect the public. That is their job. Had they not done it, God forbid they would have killed someone while racing in the streets! Some child? Some elderly person! People would then come after your City for not protecting the citizens of Gilbert. Please know you have the support of most of the town, the law-abiding citizens and legal residents of Gilbert will support your. We'll keep an eye and ear on the coming events, if necessary we will rally to support you and your Police Dept., Mr. Mayor. Feel free to call this number if there is any need for support. I'm a brown American of Mexican descent and I believe in the rule of law. I won't defend those who violate our laws. Again, Thank you for protecting your city. As an American citizen, an almost life long resident of Arizona (since age 11), AND A 100% Disabled Veteran, I want to thank you for upholding the law! Your apprehension and subsequent call to ICE, regarding the "illegal alien" drag racers was the right thing to do! If the parents of these teenagers had ANY sense or morality, they would have chosen their children' welfare over their fear of deportation. What kind of parent, turns their back on their children for fear of being arrested? Only a Criminal! Those parents should be charged with neglect and failure to provide adequate care for their children. That is Child Abuse! Please, Mr. Mayor, you must not allow the rantings and idiotic accusations of people like Tami Smull and other open border advocates to sway your cities proper stance on illegal immigration and illegal aliens. They have broken our laws the same as a bank robber has broken our laws! There is no valid excuse! Keep up the good work and set a shining example for the cities in America, that have asinine "sanctuary policies"! You have my full support! I overwhelmingly support the recent action taken by Gilbert resulting in the arrest and subsequent deportation of illegal aliens. I live in the city of Phoenix and wish my city had the courage to do the right thing the way Gilbert did. Do not be fooled or pressured by special interests and "intellectuals" threatening lawsuits or other tactics in trying to prevent future action against illegal aliens. Do not make the mistake the city of Chandler made 10 years ago by prematurely settling litigation (that they would have won) that not only cost taxpayers money, it also set a dangerous precedent. A huge percentage of legal US citizens agree with your action. My family wants to thank you for having the courage to lead the way in standing TALL as an American citizen!!! I only wish that my city council would follow your lead!! We citizens of Mesa have been BEGGING our council to give at least SOME indication that they will protect our country and its laws. My parents live in your city and I am so thankful that you have made a very positive move in protecting them both physically and materially. You have no idea what hope you have instilled in all of us that live in the East Valley!!! I just want to take a moment to thank you for taking a stand against illegals that commit crimes. You are drawing a line saying and doing what needs to be done. It is an unpopular, but right decision. My parents came to this country after World War II. They became citizens, helped build this country, never took a handout, and produced my sister and me who both are degreed professionals. I firmly believe that America is the land of opportunity, but people that want to come here to break our laws should be invited to leave. Keep up the good work. Too bad you are not the mayor of Phoenix. Thank you for taking a stand against illegal immigration. In addition to the tremendous social costs imposed on our state's infrastructure, the cost is even greater when crimes are committed by illegal immigrants. I applaud your decision to involve the Gilbert Police Department in doing what they can to ensure that Gilbert is a safe place to live and work. I just want to applaud you on your efforts on trying to do what is right, and that is enforce this nation's laws. I am a Latin-American, and a patriot. Your critics will try and attack you with no substance, other than calling you a "racist" or "insensitive". But you are among the minority on this issue who is willing to do what is right. All the polls show overwhelmingly that the majority of Americans approve enforcement on illegal aliens, but it is the vocal minority that will make it seem that you are in the wrong. Mayor Berman, i wanted to send this note last week but got side tracked. I applaud your stance on Illegal Immigration. Its a real good thing you and the city have done to insure a positive and solid growth to our fine city. I sometimes feel a i am the only one that feels that way. I am not against good, decent, hard working people that want to work in our great land, but DO IT LEGALLY! The biggest cry out i have is, " for Gods sake..Illegal is Illegal" end of story. Thanks for taking time to read this. I want to applaud you on your plan to enforce the immigration laws, especially when laws are broken. 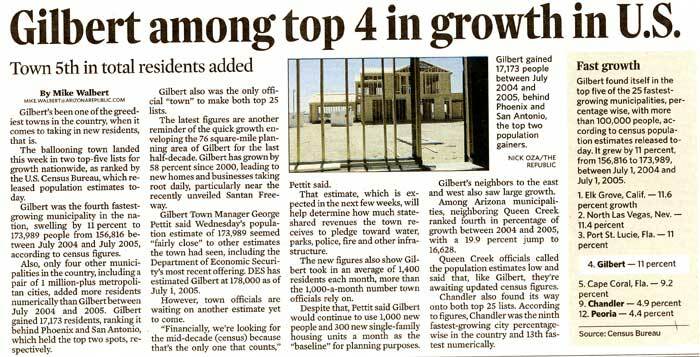 Hoepfully Gilbert can be a role model to other cities to follow suit. I will not hold my breath on Phoenix though. Thanks for having the courage to stand up for what is right. Thank you for allowing Gilbert's policemen to correctly ascertain the immigration status of the three speeding youths from Mexico and having them deported. You are doing exactly what federal laws 8 U.S.C. Sections 1325 and 1326 intended. In fact, the conclusion that state and local police possess inherent authority to make immigration arrests where individuals have violated either criminal provisions of the INA or civil provisions of the INA that render an alien deportable rests on a solid legal foundation. All federal circuit courts that have addressed the issue have recognized such inherent arrest authority, and no court has opined to the contrary. 344 Gonzales, 722 F.2d at 475. 346 Vasquez-Alvarez, 176 F.3d at 1299. 347 See supra Part II.G. 348 Wishnie, supra note 14, at 1094-95. 350 See supra Part II.G. 351 8 U.S.C. § 1103(a)(8) (2000) (emphasis added). Keep up the good work. We are in the midst of an invasion and it is time to protect our security and sovereignty, not to mention the safety of American citizens. I'm a citizen of Glendale, Arizona who is overwhelmingly happy to hear that the Gilbert Police Department stopped teen illegal allien drag-racers on your streets and turned them into ICE, which ended in their deportation!!!! I'm very pleased that you refuse to accept the Mexican matricular consular card as valid ID. A very special thank you for lining up on the side of Protect Arizona Now in 2004 in order to get Prop. 200 passed. Finally a Mayor and city council that will not pander to illegal alliens the way Chandler has since 1997! Subject: Thanks to the Gilbert PD for deporting illegal aliens! Thank you for doing the job that Bush and others in the government are not doing. It is a shame the government is not doing what it should. I just read an article that 85% of sexual predators were immmigrants. Keep up the good work, and it will keep your community in great shape. I want to comment you for your positon concerning illegal aliens comitting crimes in Gilbert .It's about time we start doing something about this problem. I back you %100.We need to send a message that we will not stand by,while people who are here illegally come to Gilbert and commit crimes.God bless you and Sheriff Joe!!! Illegal immigration has become a real concern to American citizens. The present administration and congress have taken no steps to enforce our immigration laws, and in fact, literally invite these "good, hard-working families" to come to the United States and fill the jobs Americans won't do. As a result, cities and towns throughout the country are bending to the point of breaking under the burden of many thousands of non-paying non-citizens. You are undoubtedly aware that the City of Hazelton, Pennsylvania has taken upon itself the task of passing ordinances that make it a crime to rent to or employ persons without legal documentation of citizenship. As a result, the ACLU and others have brought a discrimination lawsuit against the City of Hazelton. Should Hazelton prevail in the lawsuit, the chances are good that it will be appealed to a higher court, and on and on it goes, all the way to the Supreme Court. It could take years. The administration, congress nor the courts are on the side of we American Citizens on this issue. Therefore, we've devised a plan to help small-towns, cities and states to protect its citizens against this tsunami of humanity from overwhelming their towns. This plan is not discriminatory, it is legal, and effective in enforcing local, city and state law for all its citizens. The Supreme Court has ruled that DUI (Drunk Driving) Checkpoints are legal. Any town has only to set these DUI Checkpoints at random places and times. Many people driving without drivers license, proof of insurance, and forged or stolen documents could be detained for breaking these laws. This is a perfect opportunity to remove any illegal drivers from our highways and roadways. Also, in combination with this enforcement, local police departments can partner with ICE (Immigration and Customs Enforcement) by training police officers in handling any illegal aliens they happen to apprehend at a checkpoint. I hope you will consider this just for the fact of making our streets , towns and cities safer in the future. I just wanted to write and say thank you for your decision to deport illegal immigrants that committ crimes. It makes me very angry that America's borders have been so loose that we have let illegal immigrants into America some of them to committ crimes, sometimes more than just petty crimes. My two sets of grandparents live in the Gilbert area. They are in constant fear because of the stories that come up on the news constantly about illegals breaking and entering, robbing, killing and more to valley U.S. Citizens. My opinion my be an opinion that is a little uneducated on this specific topic but something needs to be done. I am glad you are taking a stand to make some changes. I saw on the Fox 10 News today that you turned over an illegal Mexican to immigration to be sent home. I thought I would let you know that you have supporters. I probably shouldn't be speaking for anyone other than myself so, I will tell you that I support you fully. This country is so backward it is not funny. At least you are doing something about it, what you can. You are courageous. Please keep up the good work. Most of the illegal Mexicans have nothing to offer us, are poorly educated, come with nothing, steal to support themselves here, and it is costing the rest of us big bucks. Their criminal behavior seems to escape so many Americans who support them invading this country. They bring our country down. Their labor is not so cheap as the media claims, either. Between that and the current war, I expect the country to go into bankruptcy. We need more proactive men like you, with a backbone. Please continue to do what you can. With good men like you, perhaps there is hope for the future. I support your stance on Illegal Immigrants and I support your Police Department, though not a Citizen of your City. I live in Avondale! Unfortunately I cannot see such action being taken here, because of our Mayors Hispanic Roots! I just wanted to share my support for you and to share a letter that was sent to our State Congressional Representative Congressman Miranda. We just read about the proposal to have Gilbert Police work with federal authorities to remove illegals from our town. Bravo! Rather than wait for the inevitable decay that will turn Gilbert into another Hazelton or worse, another Maywood, CA, we applaud you and Councilman Skousen acting on this important topic. Do not give in to pressures from factions aligned with that idiot and traitor, Jeff Flake. He and his cronies are selling out America with no regard to our children's futures. Do not be intimidated by Hispanic groups like La Raza or Mecha or the ACLU. We already have Mexican flags flying over homes in Gilbert and Spanish spoken everywhere we turn. We need to take back our country and send a message that illegals are not welcome here. Thank you for standing up for Americans!